Do you want to spread a word about your brand or raise some awareness to your cause or event? Wristbandbuddy offers the highest silicone rubber bracelets and slap bands with the fastest turnaround in the industry. Wristbandbuddy.com is a leading wristband manufacturer, offering a great range of custom silicone wristbands, printed wristbands, rubber wristbands and multicolour wristbands for your event, attraction, brand awareness or charity. Our wristbands can be a great way to promote your business, service or organization, and are an excellent way to position your brand name in front of your market. Our artists make all possible efforts to provide you the best service. 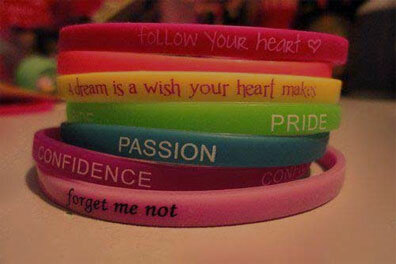 We offer fashionable, stylish, comfortable to wear and great looking party wristbands. With our procedure, we can incise any badge, clip-art or manuscript of any length around your rubber bracelets. We strive to offer the most competitive prices in the industry with the best quality. From conception to completion, our friendly and knowledgeable staff is here to assist you. If you have any confusion regarding your order, feel free to contact us at any time, our representatives are always here to guide you.